Born in 1943, famed architect Peter Zumthor studied at the College of Applied Arts in Basel and the Pratt Institute in New York. In 2009, he was awarded the Pritzker Architecture Prize for his life’s work, which includes the Kunsthaus Bregenz, Austria, and Kolumba Art Museum in Cologne, Germany. His Therme Vals, the spa complex built into a Swiss Alp mountainside, became an icon of contemporary architecture soon after its opening in 1996. 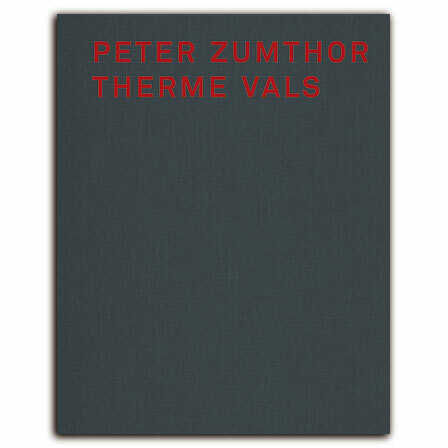 Peter Zumthor Therme Vals, the only book-length study of the mountain spa, features the architect’s own original sketches and plans for its design, as well as Hélène Binet’s striking photographs of the structure. Annotations by Zumthor elucidate Therme Vals’s symbiotic relationship to its natural surroundings, and an essay on such topics as Artemis/Diana, Baptism, and Spring by architectural scholar Sigrid Hauser draw out the connections between the elemental nature of the spa and mythology, bathing, and purity. This lavishly illustrated volume about the spa that catapulted a remote Swiss village onto the international architecture scene will entrance all enthusiasts of contemporary design. , born 1943, works with his Atelier of around 30 people in the alpine setting of Haldenstein, Switzerland, producing architectural originals like Kunsthaus Bregenz, Therme Vals, Museum Kolumba Köln or the Steilneset Memorial in Vardø.